Medieval mural painting developed in the territory of Slovakia depending on the complexity of the geopolitical and economic situation. In the Middle Ages and early formation of modern Slovakia it formed part of the Kingdom of Hungary (1001 – 1526) and, more broadly, the entire whole Central European cultural and artistic traditions later on. It is noteworthy that the Gothic style in Slovakia (from the 13th century to the end of the first third of the 16th century) not only drew inspiration from the western art centers of Europe, but also enriched their own stylish modifications in relation to France, Italy and Germany (Nordic Gothic). Isolated instances of these regional modifications of style even in mural and panel paintings are centers with a rich occurrence of Gothic monuments such as Spiš (Levoča, Bardejov, Kežmarok, Spišská Nová Ves, Spišský Štvrtok, Prešov) and Košice in Eastern Slovakia and the central Slovak mining towns – Banská Bystrica, Banská Štiavnica, Kremnica, Nova Baňa and Svätý Anton. A third area with a significant Gothic share is Western Slovakia. The forms, expressive forms, iconographical and artistic aspects of early-Gothic mural painting created the conditions for the dimensions of the stylistic removal of Gothic structures in sacred architecture in the territory of modern Slovakia, while in the same manner their liturgical and didactic religious functions were also changing. The monumental mural painting in comparison with the Romanesque style is as if in retreat. There mostly applies Italian stimuli in the field of painting in the territory of Slovakia. They were important for the richly preserved mural paintings in Slovakia in the 14th century. At the turn of the 13th and 14th centuries Roman and Tuscan painters like Cimabue, Cavallini and especially Giotto revised and gradually broke conservative representative means in support of a compositionally and physically realistic representative method. From Italy there arrived a painting innovation that became essential for the further development of Central European art and its context as well as art in Hungary. In areas beyond the Alps, painting also developed in secular areas, especially in the decorations of aristocratic residences. In Slovakia this type of secular mural is represented by the Green Room in Thurzo’s House, Banská Bystrica (around 1490). In the 13th and 14th centuries mural painting was influenced by Italianismally-penetrated Central European parishes and monastic churches. In Slovakia, in relation to the architecture, it became the dominant artistic medium. Impressive painting works particularly include the Legend of Saint Ladislav cycle in Veľká Lomnica (1310 – 1320), the cycle of the life of Saint Anthony and Christological scenes at Saint Elizabeth’s Church in Dravce (the last third of the 13th century) and the band narrative painting in the Church of Saint Egídius in Kraskov (late 14th century), which connects the Ladislav legend with New Testament motifs. 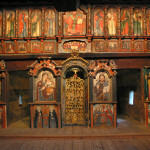 There are further paintings in St. Nicholas’ Church in Ochtiná (middle 14th century), in Štítnik (from middle 14th to late 15th century) in Levoča (14th –15th centuries), in Poniky (circa 1415), where there also remained the base of the main paneled altar and in Lurdová (the first half of the 15th century). A specific group of mural paintings form paintings in small rural churches in Necpaly and Čeríne, a stylistic and iconographic composition of the intermediary in Slovakia, mainly Italianized, form of Gothic paintings. The key visual and structural phenomenon of the Gothic style – disembodied walls – in the west, were mainly capitalized in the form of stained-glass paintings. In Slovakia, however, only a few fragments were retained. Panel painting was intended not only for the liturgical needs of religious life (altar retable, didactic board or privately devotional images of the “andachtsbild” type), but also matched the growing interest in individual portraiture and personal representation. The intertwining of Italian and French influences in Central Europe resulted in unique comprehensive panel painting (e.g. Karlstejn Castle, by Master Theodoric around 1360). The most important Gothic panel paintings from Germany are documented from the early 14th century in the Rhineland (Cologne), then especially at Nuremberg in the 15th century. Around 1450 the master of Tucherov’s altar from Nuremberg created the Death of the Virgin Mary altarpiece for the chapel in Spišský Štvrtok, Slovakia. From Bohemia (Master of Vyšebrodský’s altar, after 1360, master of Třeboň’s altar, after 1380), after the Hussite Wars, the stylistic focus shifts to the east (the Passion altar triptych by Hronský Beňadik, 1427), to Vienna (Master of Albrecht’s altar, the altar by the “Schotten” Master, both circa 1440) and to Krakow and Košice (the Altar of St. Elizabeth altarpiece, after 1474). Gothic panel painting reached its artistic peak in the lowland towns, which from the early 15th century promoted more realistically understood symbols filled with decorative and attractive images at the same time. Artists such as Jan van Eyck and Rogier van der Weyden influenced the formation and development of early individual portraiture as a specific painting genre. Resonances of the Gothic style in panel painting are represented in Slovakia by the true art of the Danube school. In the Franco-Flemish area of Western Europe there were created the most important works of book paintings and miniatures (Jean Pucelle, active in the years 1319 –1334, the brothers from Limburg, Simon Marmion in the year 1420 or 1425 –1489). This painting also initially interlocked with linear styles of Romanesque painting, thanks to botanical illustrations and medical treatises (e.g. Tacuinum Sanitatis), however, opening up the study of nature. Already in the early 14th century there was created a distinctive decorative system with imaginative plant decorations (acanthus), initials and modeling figurative scenes (grisaille), which were later enriched as the country required. In the 13th and 14th centuries there were also the illuminated chivalric novel and courtly literature. However, according to the content, liturgical manuscripts (missals, antiphonaries, graduals, small “hodinky” prayer books) remained dominant. In the 14th and 15th centuries miniatures in Slovakia, especially Bratislava, drew inspiration from the developed Czech (Martyrologium Geronské, early 15th century) and Austrian book painting (Kremnica town books, circa 1426). In some manuscripts (Košice gradual, circa 1518) and Gothic retables from the territory of Slovakia one can see the gradual application of Renaissance stylistic elements. The illuminators’ work was also closely related to the production of the liturgical embroideries and ceremonial liturgical clothing (chasuble, vestments, miters). In the 14th and 15th centuries the highest quality products included German, French (Antependium from Narbonne, around 1375, Jean de Bondy: Apocalypse of Angers, before 1380) and Czech craftsmen (Kazu from Rokycian, circa 1370; Paramentos for Trent bishop George of Liechtenstein, before 1400). In Slovakia, vestments from Košice and Banská Bystrica (around 1400) are preserved. From epistolary and book illuminations arising in Slovakia from the end of the 13th and especially in the second half of the 14th century, there have been preserved some artistically precious incunabule. Most of the illuminated Gothic manuscripts, however, are found in archives, libraries and museums in Budapest. In the first third of the 15th century there originated several unique illuminated letters and biblical-liturgical literary works such as the Košice armorial deed (1423), the Kremnica town book, which is dated around 1426, later the Bratislava Missal (from 1430), the municipal chronicle from Banská Štiavnica (from 1432), the Bratislava Antiphon IV (1420 – 1440) and several works from the period of the latter 15th century. With regards to the spread of Gothic art, in addition to the extraordinary mobility of artists, graphic art (woodcut and copperplate) also contributed in the late Middle Ages. 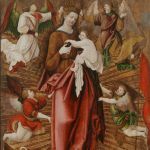 In these artistic techniques there excelled mainly southern German masters (Albrecht Dürer, Lucas Cranach, Master ES and others), whose influence on panel painting is also strongly reflected in Eastern Slovakia (the main altar of St. James in Levoča in the years 1507 – 1514, or the Altar of the Nativity of Christ in Bardejov, around 1490). Resonances of the Gothic style in Slovakia date back to the early 16th century, when in Late Gothic art there was applied a so-called beautiful style with a penchant for nature and the humanization of sacred art characters. The contemporary sculptor Master Pavol from Levoča was a painter in the mining towns – Monogramist MS. In 1506 he created the tabular altar of the castle church of St. Catherine in Banská Štiavnica with themes of the birth, crucifixion and resurrection of Jesus Christ. Only one of the panels, however, remained in Slovakia and is located in the castle of Saint Anton (Nativity of Christ theme).